However, they are still down on power compared to other cars in their class. 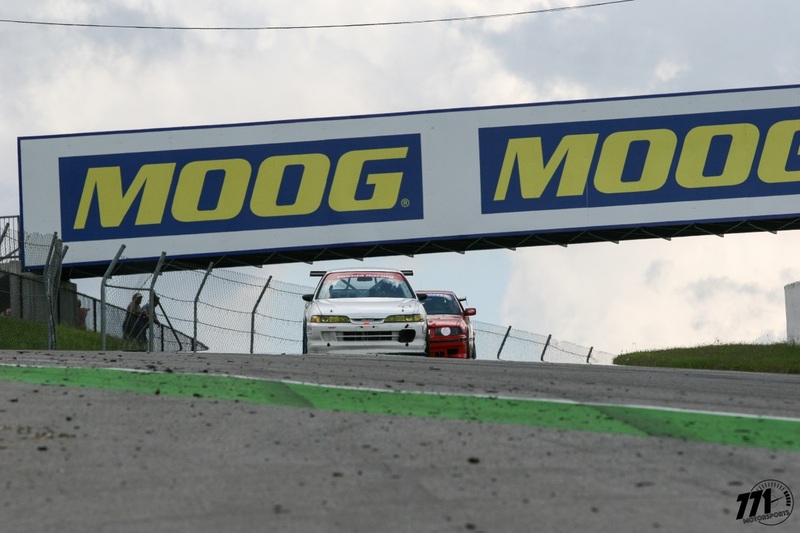 This is a significant disadvantage for the Grand Prix track at Canadian Tire Motorsport Park. To overcome the power deficit, 771 Motorsports driver Pauly Plewa really had his work cut out for him. The race format for the Pirelli GT Sprints weekend consists of two practice sessions, one qualifying sessions and a total of three 25 minute races, spread over the course of two days. Grid positions for races two and three are determined by results from the previous race. 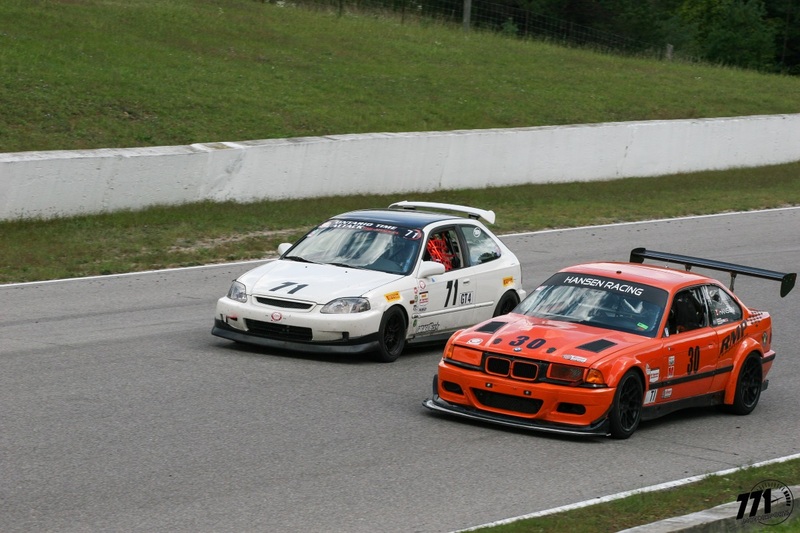 The 771 Motorsports Honda Civic runs in GT4, whereas the BMW M235i run by RMP compete in the faster GT2 class. Five different classes of cars are on track at the same time, ranging from GT1 to GT5. 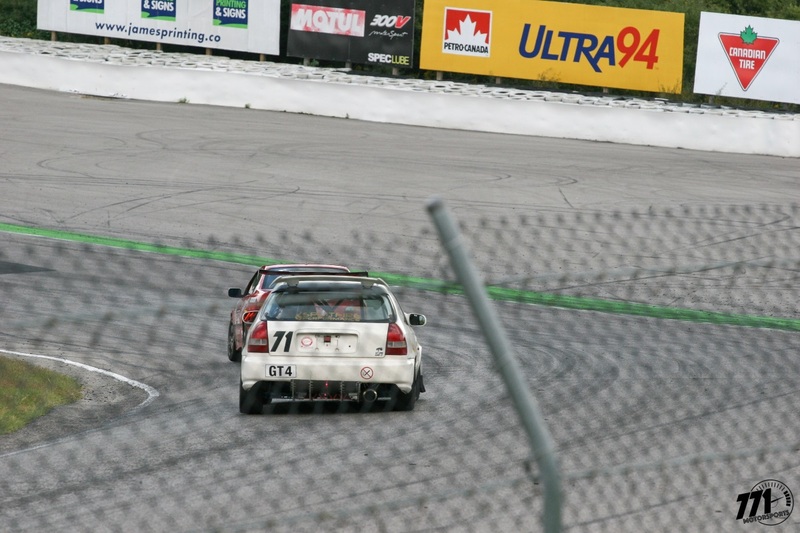 Classing is determined by lap times, similar to bracket racing on the drag strips. 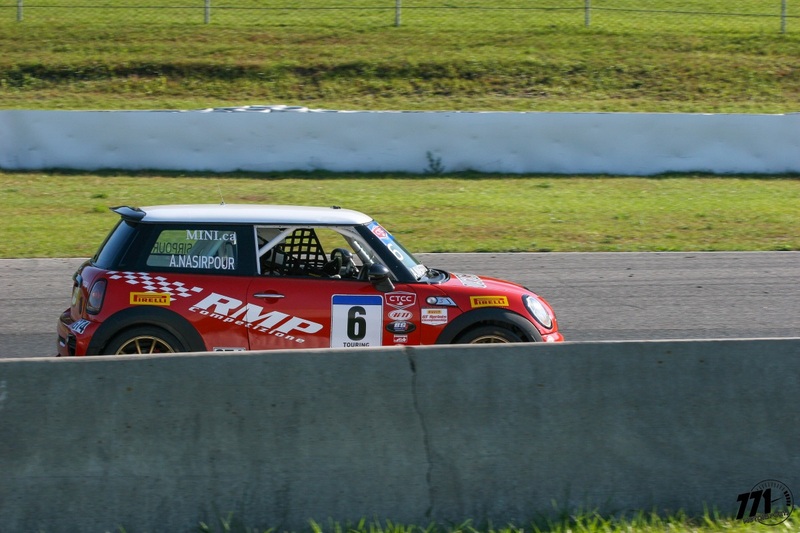 771 Motorsports was off to an iffy start after team driver Pauly reported poor pedal feel in the first practice session. His father and team mechanic Andy bled the brakes to check for air in the system. He also checked the brake pads, but everything looked normal. Based on the symptoms, RMP Competizione suggested the cause may be a faulty master cylinder. The brakes still had stopping power but the team had no time, so Pauly went on track for qualifying. Despite the questionable brakes, he qualified in second place with a 1:37.292 and improved his personal best by 1.5 seconds! 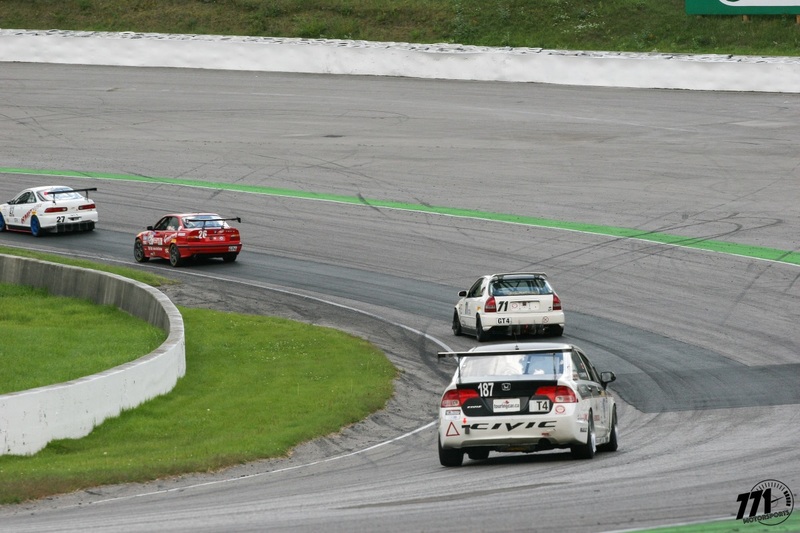 However, he was still two seconds behind Demi Chalkias in her BMW E36. 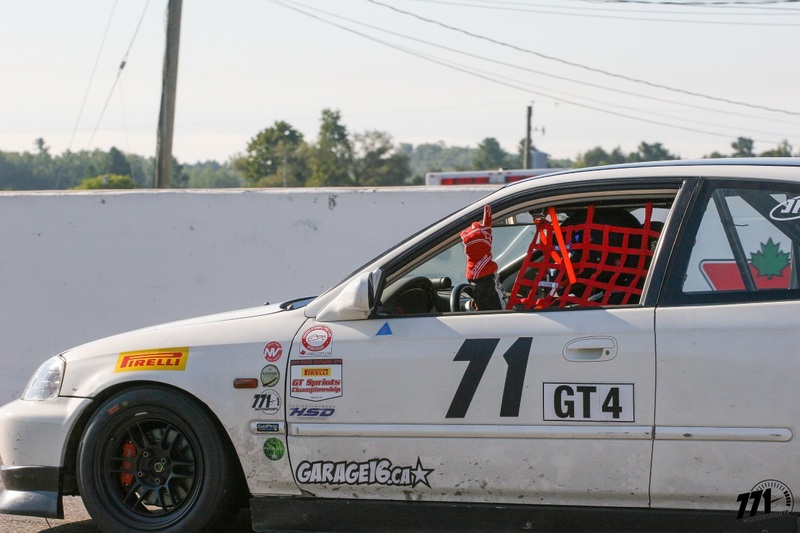 He also has John Dipchand Jr. in the Acura Integra Type R and Marlin Langeveldt in a Mazda Miata in third and fourth place within half a second behind him. 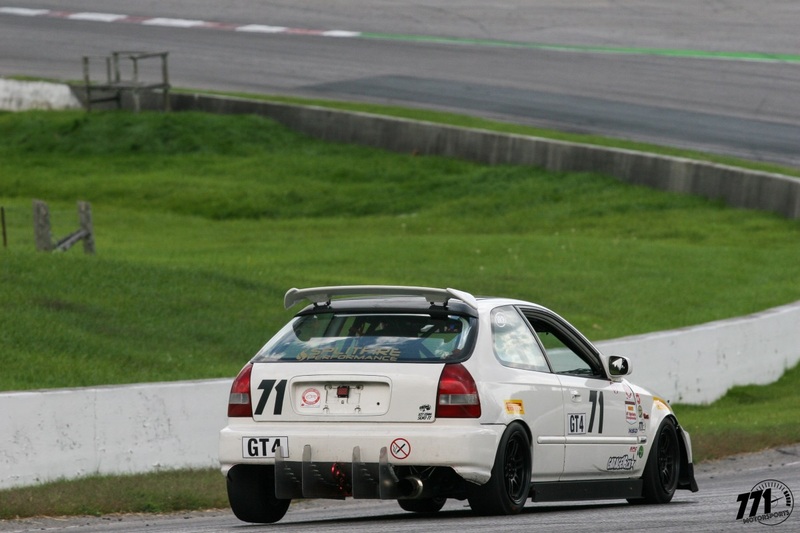 Since the last race, Andy has custom fabricated a rear diffuser for some added stability at high speeds. Combined with the corner balancing and race alignment dialed in by Scott at Can-Alignment, Pauly has newfound confidence in the car. Starting in second on the grid, Pauly had his eyes set on top of the podium. He charged out of the gate strong and put down a blistering 1:36.138 on lap three, smashing his previous personal best that he just set in qualifying! Being down on power, he has to to rely on faster cornering speeds to keep up with the GT4 front-runners. On his fourth lap, he went in fast on turn three, a right hand sweeper with a slight bump mid-corner. It was enough to unsettle the car and pushed him out wide. Staying true to his motocross roots, Pauly kept his foot on the throttle and wrestled the car back on track. Close call! 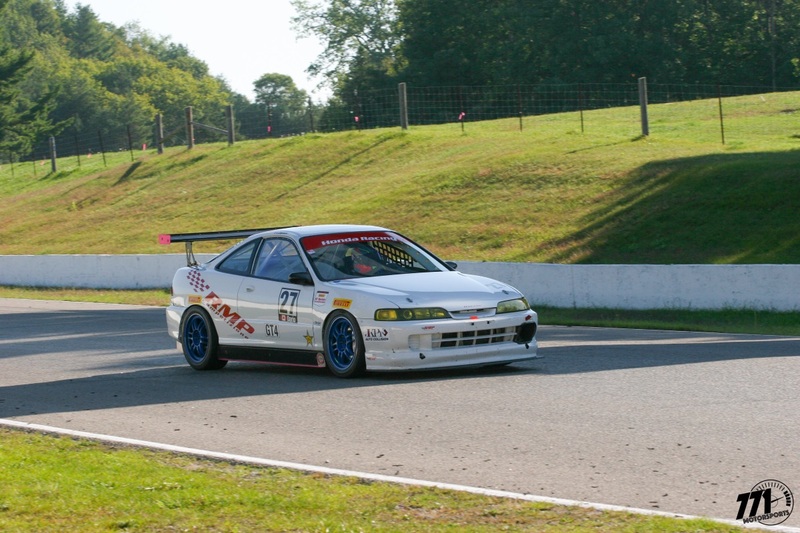 Thanks to Velocity Motorsports Club for the on-board footage from their T4 Honda Civic touring car! John Dipchand Jr. also had a hot start and leapfrogged in front of both Pauly and Demi Chalkias early in the race. John would continue holding the lead throughout the race. Back to Pauly, he continued to push hard and passed Demi as her BMW seemingly started to lose power. However, his tires started to degrade and he was unable to stay in the 1:36s. Somehow Demi managed to regain her pace and passed Pauly for second place. He would go on to finish the race in third place. 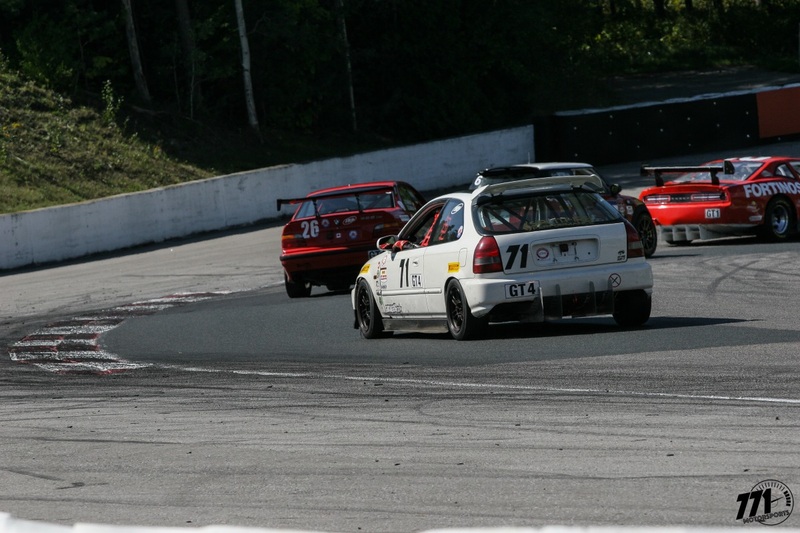 After an eventful first day, 771 Motorsports was ready for race number two on Sunday. Luckily, there was minimal damage to the car from the off-course excursion from the first race. Adjustments were made to the tire pressure and Pauly was back on track. The second day will prove to be more challenging as Ali Nasirpour and his turbocharged Mini Cooper S will be joining the GT4 field. Pauly was unable to match his own pace from the previous day, but he drove a competitive race. Ali made an impressive charge from the back of the GT4 pack and caught up to Pauly in second place. 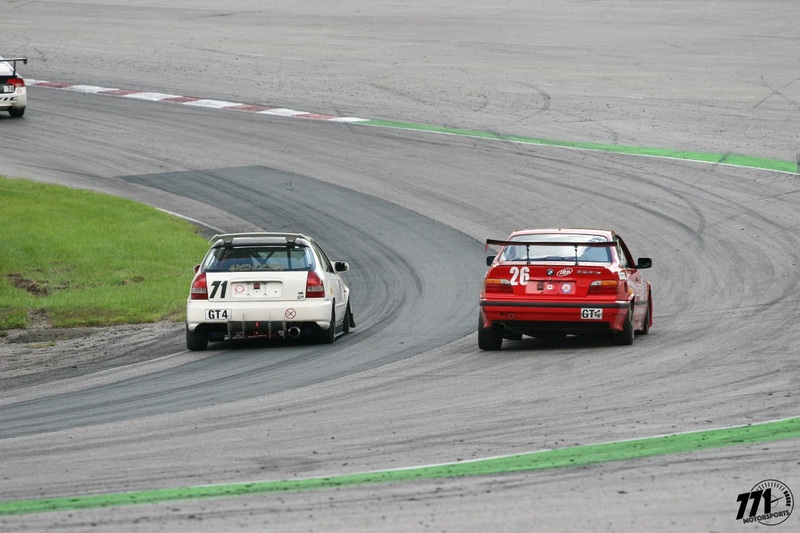 The hatchback battle intensified as the race drew to a close. On the last lap, Pauly made a critical mistake and went wide at turn four. This left the door open for Ali to squeeze past the Honda, pushing Pauly to third place and never looked back. Earlier in the race, the two GT4 leaders made contact with each other. 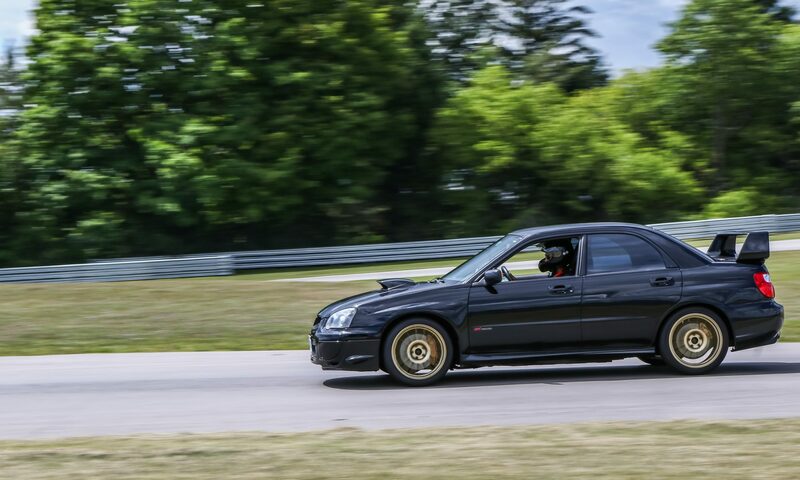 This forced John to pull his Integra off the track and finish six laps down. Demi’s BMW cruised to the finish in first place while Pauly was busy fighting off the other cars. In a dramatic turn of events, the BMW was bumped to last place due to the incident. Ali was promoted to first place and Pauly moved up to second! 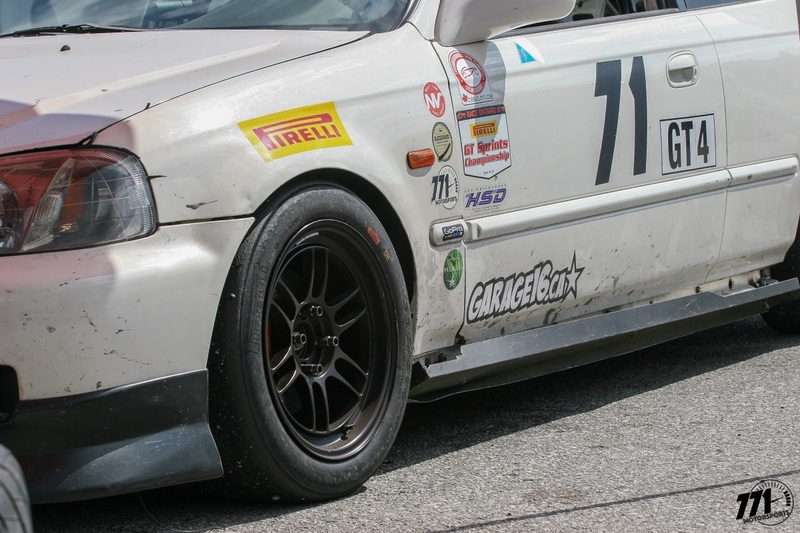 The 771 Motorsports Civic did not escape without new battle scars though. Slight contact with a GT1 car damaged the side skirt and rear passenger wheel. Luckily the damage was only cosmetic. With two podium finishes in a row, Pauly is in great position to take the GT4 class win for the weekend. 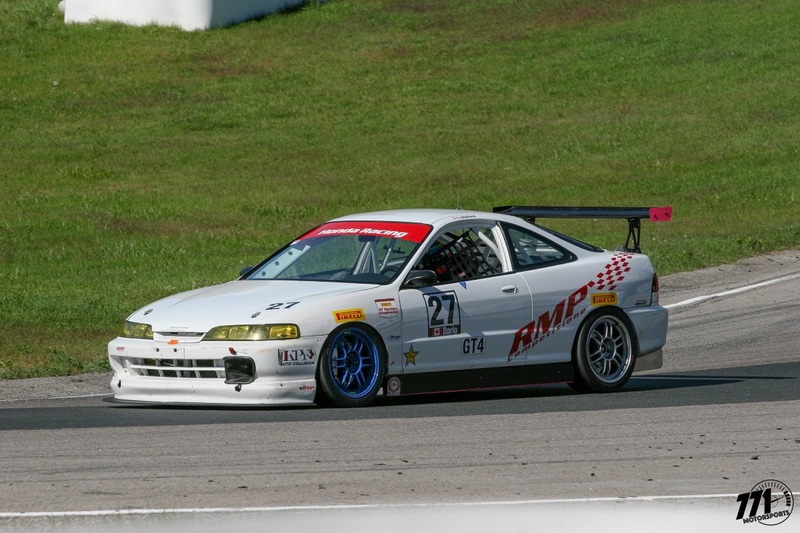 Within the first two laps of the race, John made a furious charge and gained four positions in his Integra Type R to take first place! 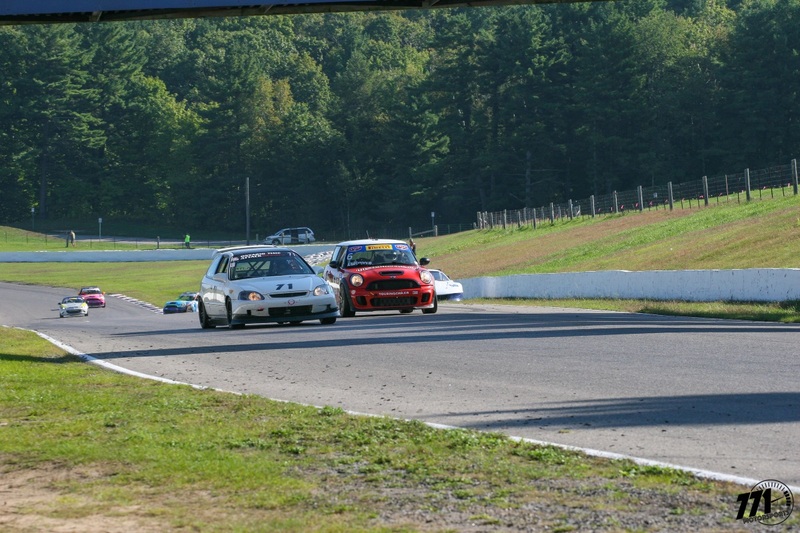 Ali was able to fend off the rest of the field for second with his MINI, and Demi’s BMW overtook Pauly for third. Sadly, Pauly never got an opportunity to catch them out in front. The remainder of the race finished under full course caution, marking a rather anticlimactic end for the Pirelli GT Sprint races. Overall it was a very successful weekend for 771 Motorsports. With the new suspension setup, aero and fresh tires, Pauly managed to improve his previous personal best lap time by about two and a half seconds! His consistency also paid off at the end. 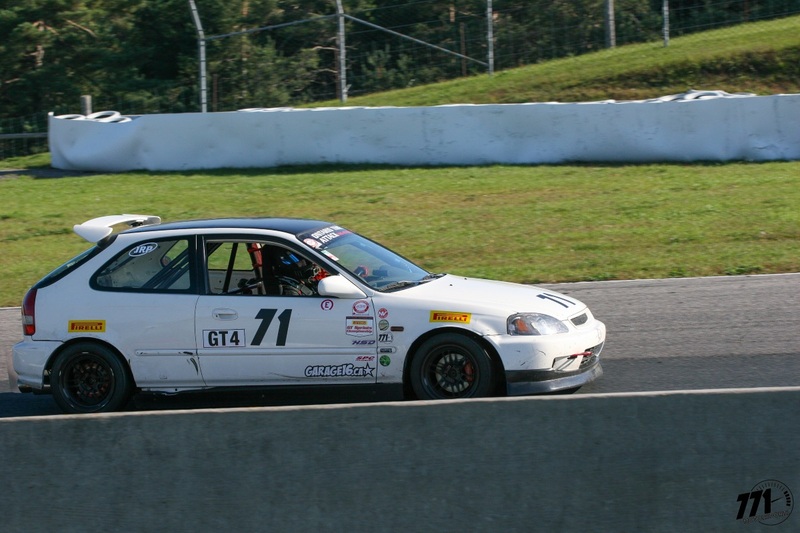 By scoring points in every session, Pauly piloted the Honda to a second place finish for the weekend in GT4. Most importantly, both him and the car came back in one piece. 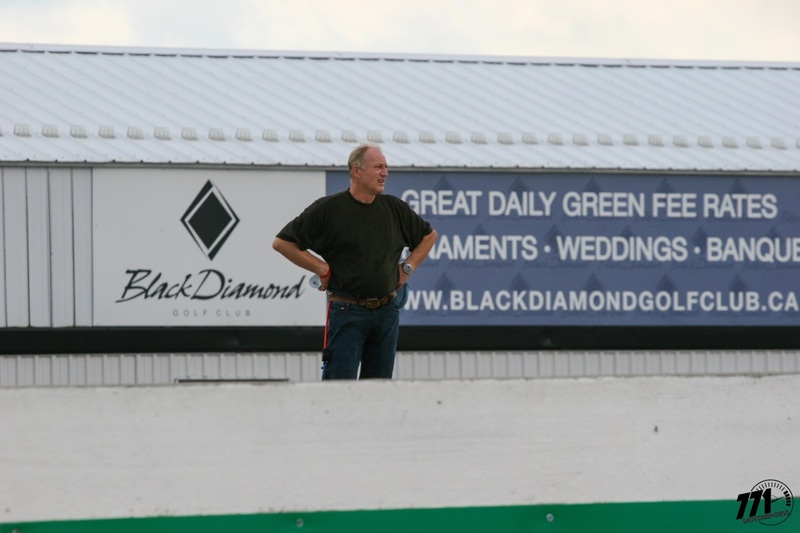 771 Motorsports team mechanic Andy Plewa looks on from the pits as he watches his son Pauly battle on track. 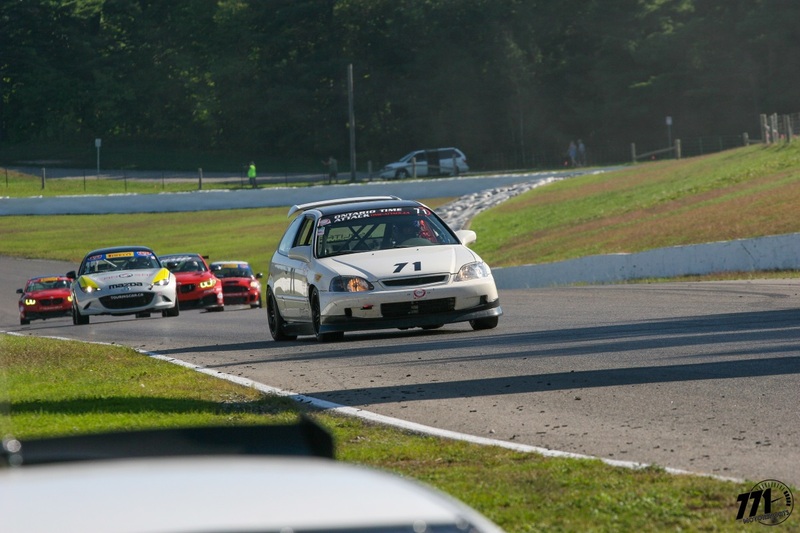 The final race of the year will be the Celebration of Motorsports on September 29-30th at CTMP. With only two weeks to prepare, there is no time to make big changes to the car. Now that Pauly has proven he can run at a podium pace, the main focus will be fixing the braking issue as well as continually improving car setup. 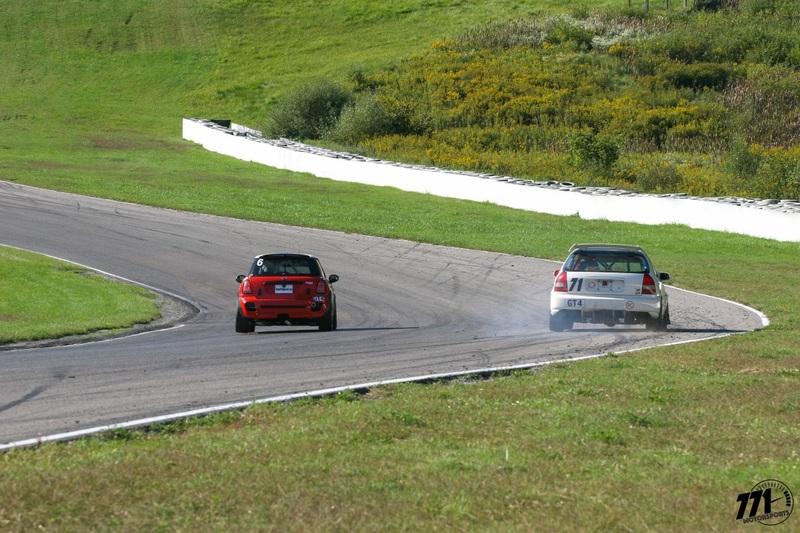 Event coverage for the Celebration of Motorsports at CTMP will be coming soon. 771 Motorsports have uploaded the full on-board footage from Pauly’s Go Pro during race 1 of the Pirelli GT Sprints Indian Summer Trophy weekend. This includes the epic off-course at turn three, starting at the 09:30 mark!